I’ve just created a quick video giving an overview of a brand new article research tool I’ve just developed. It’s called ‘Answer Analyzer’ and it uses a unique method of obtaining relevant information that you can then use for your own articles. If you write articles for your own websites or for other people then this tool is a must. I used it myself to write a couple of articles on subjects I know nothing about… and it’s amazing how easy it is to find quality information and facts to include within your articles. Watch the video and then carry on reading to see how you can grab a BONUS copy this Friday (21st September ’12)…. Watched the video? Ok, so basically the software taps into the HUGE Yahoo Answers site and allows you to find questions and answers on literally any subject or niche imaginable. This allows you to find excellent facts and information to base your articles on. Whether it is a product or anything else. Ok, an amazing software tool called “Meme Crusher” is being released this Friday 21st September ’12 at 12pm EDT (5pm UK time). I’m seriously “buzzing” about this software as it is super unique and a great way to increase traffic to your website. Not to mention it was created by Paul Clifford! So, What Is Meme Crusher? Meme Crusher is a desktop application (PC or Mac) that allows you to create memes (funny images with slogans) that you can then post to Facebook, Pinterest etc all from within the software. You can then track who shares your meme’s to see how “viral” they are and how many people they are reaching. You can include a link with your meme’s when posting them which can create a FLOOD of traffic to your websites and squeeze pages etc. It’s very easy, very quick, FUN to use… and can allow you to reach thousands of people in very little time using the power of social networks. Great for links and traffic! How Do I Get A Copy Of Meme Crusher And A FREE Copy Of Answer Analyzer? I will be sending an email out at about 12pm EDT this Friday. Those who act quickly will get Meme Crusher at the lowest possible price… and will ALSO get a FREE copy of my latest article research software, “Answer Analyzer”. 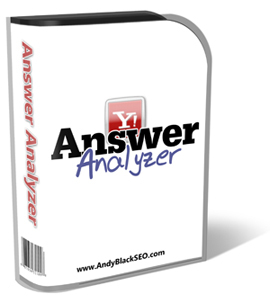 I am giving away 100 copies of Answer Analyzer and it will be strictly on a first come, first served basis. Keep an eye out for my email this Friday and act quickly! Count me in Andy! It looks a very good desktop tool and could reap some serious benefits with traffic and sales. If I miss out on the bonus this Friday, how much is Answer Analyzer usually? Wow, this is awesome software. My articles have been solid but the writing process doesn’t ever seem to get any easier. But now, it looks like the type of tool I needed is finally available. Looks a nice little tool Andy. what happens if we don’t want Meme Crusher but just your product? It’s a new tool and at the minute I’m only planning on giving this away as a bonus for those that buy Meme Crusher. Bonuses are just that…. it’s better to pay X amount and get two products than pay the same or a similar amount and just get one. I can’t say if it’ll be available via other means yet but right now it is just as a bonus.